At one point in time, Alli and Nick were best friends. They had grown up together despite challenges of time, distance, and fame. They understood each other in ways that no one else ever could, and they trusted each other with everything. As Alli soon realizes, things change. Only months into the Into The Millennium tour, Nick is an entirely different person from the boy that left Tampa at the beginning of the tour. When Alli arrives to visit, she's both shocked and amazed by the change in her friend's demeanor, but also determined to bring back to the friend she used to know. Unfortunately for Alli, Nick is just as determined to retain his older, rougher image. Their friendship had once been stronger than anything else. Now, in the dawn of its dissipation, Alli makes the decision to fight for them. And yet, by the time she finally manages to achieve her goal, it might be too little, too late. Still not sure what you're getting into? PREVIEW this story. 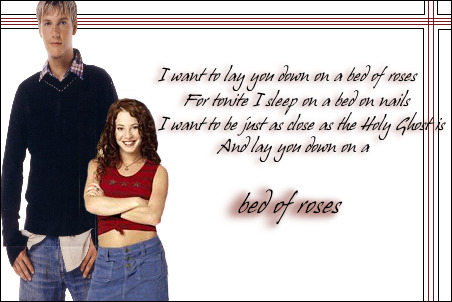 12/31/02 ~ "Bed of Roses" is now FINISHED. Want to know when I update? Just point and click! Click here to read the SEQUEL to "Bed of Roses"